First of all, both dogs did FABULOUSLY! I am very proud of both of them. It was another scorcher so we did our best to keep everyone hydrated and in the shade as much as possible. 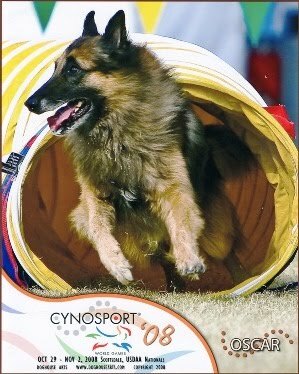 There were nearly 1000 dogs entered in the USDAA agility portion of the show. 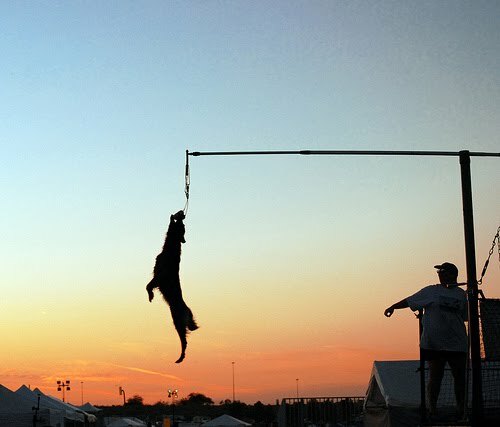 Out of 174 Championship teams (3 dogs per team) with competitors from Mexico, Puerto Rico, Japan and all over the U.S., Oscar's team "Let The Fur Fly" ended up 58th, which is the best we've ever done. The relay cut-off was the top 29, so we were thrilled to be so close with National and World level competition! Emmy's team - "Belgians Bordering on Insanity" - ended up... NOT LAST! <woohoo> We finished at #147th, mostly because we had a few E's (eliminations) from our teammates. That's ok! We were there to have fun, and we did! We were fortunate to hook up with a super gal from Oregon and her Border Collie, Speck, as our 3rd and nobody took themselves too seriously. Emmy really did a very very nice job and is showing great potential. Just a few faults here and there, mostly knocked bars or missed contacts, and we need to work a little on her jump efficiency, but those are all easily workable. She showed good speed and focus throughout the event. Our Steeplechase Quarterfinals were very nice, but each dog had a fault, which kicked us out of the Semifinals. Very disappointing! 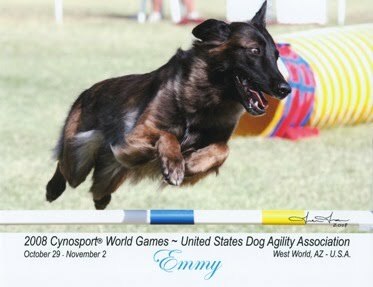 Especially since I didn't know Emmy had gotten a contact fault until later, which knocked her down to 6 away from the top 15 qualifiers out of 59 dogs in the 26" class. Oscar was 11 out of qualifying. Darn! You can see some of our videos on YouTube. Anna was kind enough to post them on her account, but will send me the originals so I hope to have the entire set on our site at some point. 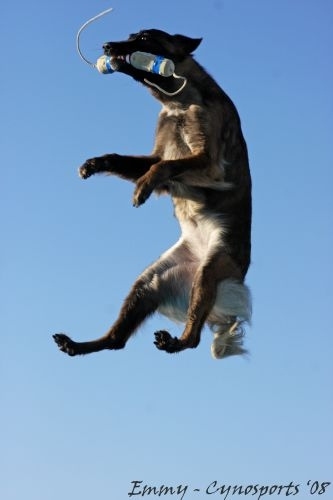 Emmy was pre-qualified for the Splash Dogs Super Vertical World competition on Saturday. She was feeling great after all that agility so I decided to enter her. Out of 20-some entries, many of whom had 7-foot jumps under their belts, Emmy made it thru to 4th place with a high jump of 6'-8"! This matched her personal best. Her sister Pico went out at 6'-10" for 3rd place and a new personal best. 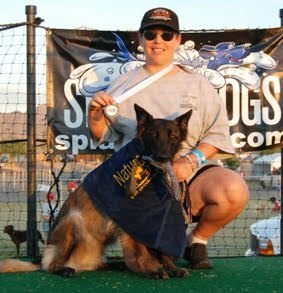 2nd place was at 7'-0" and 1st place went to Stryker, who always wins, and had an "easy" catch at 7'-2". The weather was HOT and 5 days of competition agility tiring, but we're all figuring out how to get qualified for next year! There was live streaming video of the finals and video on demand to watch at any time. All the scores are posted on the USDAA site - http://www.usdaa.com/news.cfm. There are course maps and commentary, as well, if you are curious about what courses look like these days. They've gotten so much more difficult than they used to be! I still need to update our site (all the way since August!) but hopefully I'll get to it in the next couple of weeks! Proudly sponsored by Natura Pet Foods!